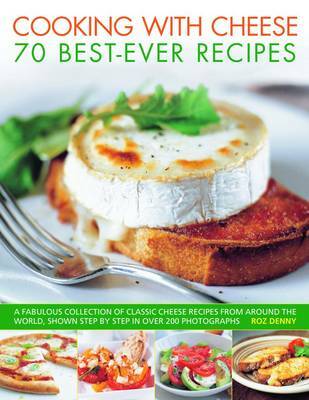 This title offers over 70 of the most popular cheese recipes from all around the world. This is a collection of fabulous dishes featuring a wide range of cheeses, from Mozzarella and Manchego to Feta and Cheddar - fresh, melted, grilled, baked, grated, deep-fried and more. It includes a special desserts section with sweet treats such as Velvety Cheesecake, Tiramisu and Sicilian Cassata. It is fully illustrated throughout, with easy-to-follow, step-by-step instructions. Whether Gorgonzola or Gruyere, Mozzarella or Mascarpone, Edam or Emmental (to name a few), just about everyone has a favourite cheese and a favourite way of eating this most tempting and versatile of foods. Featuring recipes such as Mexican Tacos, New York-style Lasagne, Hot Halloumi with Roasted Peppers from Cyprus, Italian Porcini and Parmesan Risotto and more, this is the ultimate recipe collection for cheese lovers everywhere.